This week marked the opening of Roti Mediterranean Grill (Monday) and Potbelly Sandwich Shop (Tuesday) at the L’Enfant Plaza Promenade food court. Roti’s hours of operation are: Monday – Friday from 6:30am – 8pm and Saturday from 11am – 4pm. It’s closed on Sundays. Potbelly will be open Monday-Friday from 11am – 7pm and Saturday from 11am – 5pm. It’s also closed on Sundays. This is the third Potbelly to open in Southwest (the others are located at 3rd & D Street and at The Portals on the 1200 block of Maryland Avenue). Above and to the right are photos of the line at Roti during lunch today - the line wrapped around the corner. Lines were long at Potbelly on its second day of operations, but a security guard wouldn’t allow me to take photos (I guess I look like a terrorist or a scout from Quiznos?). Other retailers and restaurants will open in the next few months, including Gateway Newstands (spring), Frozen Yogurt Indulgence (spring), Gourmet Too (spring), Au Bon Pain (summer), Mamma Ilardo's (summer), Five Guys (summer), and Moe’s Southwest Grill (summer). Below is a YouTube video shot yesterday by Chase Communications of the grand opening. L’Enfant Plaza is owned by the JBG Companies and the renovation was designed by SmithGroup. 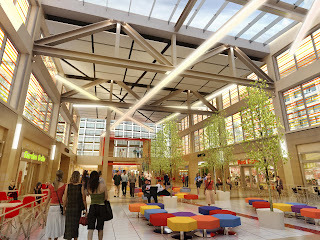 Phase I of renovations began in November 2009, which included the food court area near the Metro entrance. Phase II began on March 1 and will last approximately 30 months. 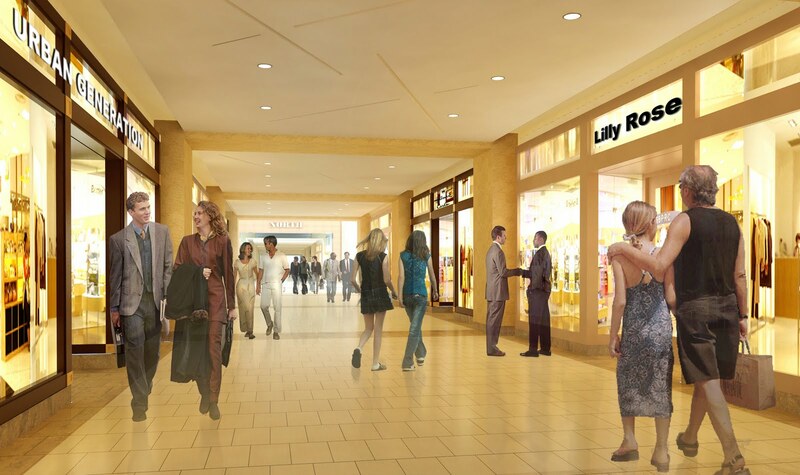 The rest of the retail promenade will be redone during this phase with nationally-recognized retail and a large glass atrium will be built where the glass pyramid now is located. 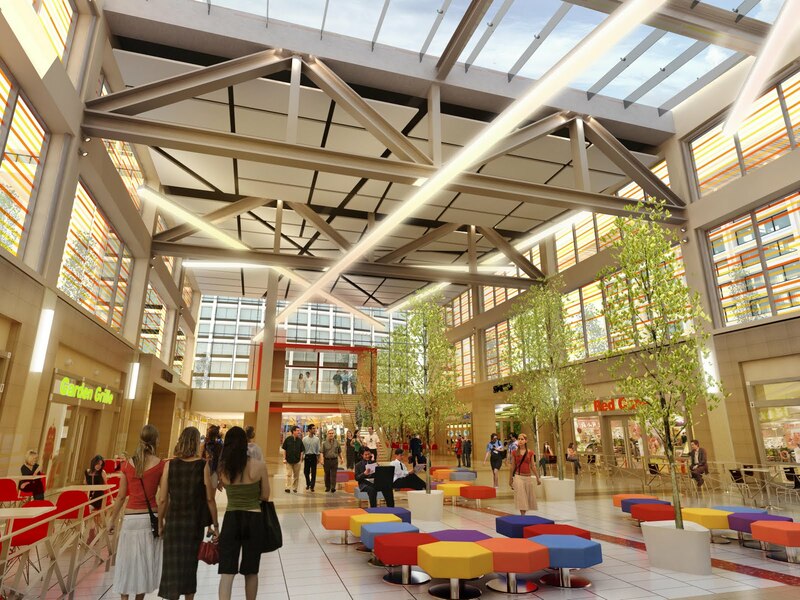 Below is a rendering of the glass atrium (a section of the retail corridor in Phase II is rendered above left). ate at the new Roti yesterday! always delicious! I do kind of wish it wasn't inside the plaza because it deserves to get other customers from passing by , but oh well. I am on a planning task force for the area north of I395, including L'Enfant Plaza, and have requested they find ways to open this complex to Southwest residents better. Two of my suggestions: A more friendly entrance behind the HUD building off 7th Street, or from the 9th Street bridge a pedestrian stairwell/escaltor up into the shopping area. The next task force meeting is Tuesday. Bob, where else is a good place in that area? I am one of the owners going into L'Enfant and would love to hear where/what the planning task force has in mind! In addition to the re-vamped, re-opened space, the restaurants are composting! EnviRelation is delighted to be working with the JBG Companies and Pritchard Industries to help green the Promenade. For more information about us, check out www.EnviRelation.com.